“Although slavery is no longer practised in Brazil, its legacy casts a long shadow,” they write. The experience of violence and pain is repeated, dispersed, and persists in modern Brazilian society, affecting so many aspects of people’s lives…. The indelible mark of slavery conditions Brazilian culture; the country defines itself on the basis of gradations of skin colour. Brazilians have elected a white woman as president (Dilma Rousseff, who was impeached and removed from office in 2016, is the daughter of a Bulgarian immigrant). But they have never had a self-identified Afro-Brazilian occupy the office (although one early-twentieth-century president was widely believed to be “passing” as white and was ridiculed as such in cartoons and song). Bolsonaro is of Italian and German descent, while his vanquished opponent, former São Paulo mayor and education minister Fernando Haddad, is the son of a Lebanese immigrant, as is the country’s extremely unpopular current president, Michel Temer. Yet in a contradiction that outsiders find hard to fathom, Brazil is also “a country that does not obey the established correlations between the dominator, on the one hand, and the dominated on the other,” the book cautions. African influences are present in almost all aspects of daily life and are mostly embraced even by the whitest of Brazilians as a point of pride. The mixture of races in Brazil is “unequalled in any other country,” they add, and has “generated a society that was defined by mixed marriages, rhythms, arts, sports, aromas, cuisine and literary expression,” producing “new cultures born from its hybrid nature and variety of experiences.” Hence the spectacle of whites who claim “a foot in the kitchen” (a clearly racist slang expression indicating some small portion of African ancestry) as a badge of authenticity. Both Schwarcz and Starling are distinguished scholars with important works to their credit. Schwarcz, a professor of anthropology at the University of São Paulo and a visiting professor at Princeton, has written biographies of Emperor Pedro II, the émigré French painter Nicolas-Antoine Taunay, and the mulatto writer Lima Barreto, as well as pioneering studies of race such as Not Black, Not White, Just the Opposite: Color and Race in Brazilian Sociability (2013) and The Spectacle of the Races: Scientists, Institutions, and the Race Question in Brazil, 1870–1930 (1993). Starling, a historian and political scientist who teaches at the Federal University of Minas Gerais, is the author of Memories of Brazil (1999) and The Lords of Gerais (2018) and has edited journals and organized conferences that explore the juncture of politics and culture in Brazil. Intertwined with the long history of racial and social inequality and exploitation they describe is a deep-rooted pattern of corruption. If members of the elite were allowed to regard other human beings as their personal property, then why not also the nation’s resources or even the state itself? Brazil was originally organized as a set of hereditary “captaincies,” which the authors define as a system that “delegated the task of colonizing and exploiting vast areas of territory to private citizens” with “supreme powers” over the domains they controlled. From there, it is not at all difficult to draw a line to the greed and malfeasance of more recent kleptocratic governors, mayors, and legislators at all levels of government, culminating in the wholesale looting of the public treasury during the rule of the Workers’ Party from 2003 to 2016, when Luiz Inácio Lula da Silva and Rousseff were in office. When independence was finally achieved in 1822, it came in a form that distinguished Brazil from the rest of the Western Hemisphere. Fleeing an invasion by Napoleon’s troops in 1807, the Portuguese royal family and court sailed to Rio de Janeiro, instantly changing Brazil’s status from colony to seat of a global empire in which “Portugal had been relegated to a secondary position within its own imperial system.” King João VI returned to Lisbon after the Liberal Revolution of 1820 broke out, while his son and heir, Pedro, remained in Brazil as regent. Two years later he declared Brazil’s independence and became its first emperor. Revolutionary upheaval and the political fragmentation that soon afflicted Spanish America were thus avoided, with the monarchy providing a symbol of national unity for nearly seventy years. But that stability came with a high price: the same tiny elite remained in control, largely hostile to new ideas and eager to guard its privileges. Brazilians have always wanted their country to be taken seriously, to be seen not just as a stronghold of soccer and samba. But given the centrality of soccer in Brazilian daily life, especially as a symbol of pride and mastery, it is surprising that nowhere in the book’s six hundred pages of text is Pelé mentioned; in general the sport itself, which along with the entertainment industry was traditionally one of the only avenues for Afro-Brazilians to rise socially and economically, receives short shrift. The authors acknowledge that soccer is “an iconic metaphor for Brazilian nationality,” but the only soccer stars they reference are Sócrates and Reinaldo, and then only for their political activities. I would also like to have seen some discussion of the importance of the semi-official death squads that operated with impunity during the military dictatorship and over the decades evolved into private “militias,” which strongly supported Bolsonaro. More attention could have been paid to Brazil’s homegrown environmental movement. And whatever happened to the very useful chronology, setting developments in Brazil alongside others around the world, that appears at the back of the Brazilian edition? 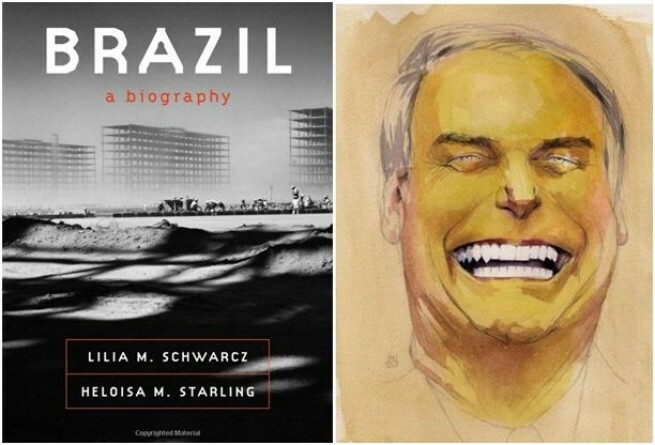 Brazil: A Biography reads as if it were translated by committee (no individual translator is credited on the title page). Terms with established meanings in Portuguese are translated one way in one chapter, only to be rendered as something different in another, and sometimes the choices seem questionable or awkward. “The Brazilian imaginary,” for instance, appears repeatedly throughout the book, as a literal equivalent of the common phrase o imaginário brasileiro. But a more colloquial, less jargonistic version would be something like the “national memory” or “collective imagination.” In some later chapters, the phrase “collective memory” does appear. So why not be consistent? But the American edition of Brazil: A Biography includes a welcome fifteen-page afterword, dated August 2017, that serves as a helpful guide to recent developments and takes the authors’ analysis past the point by which three consecutive popularly elected civilian presidents had each won two terms. This was a first in Brazilian history and a promising sign that democratic values were taking root. Other positive signs abounded during this twenty-year period: economic inequality began to lessen under Cardoso, a sociologist turned politician, and continued under the now-jailed Lula and Rousseff, his hand-picked successor. That brought the authors and their country to 2014, when everything began to fall apart and the scandal involving the theft of billions of dollars from Petrobras, the state oil company, and other government agencies came to light. Shortly before this, “a pervasive hatred directed towards politicians surfaced, and exploded,” they write, and the national mood over the past four years has shifted from perpetual optimism to unrelenting bitterness and unbridled anger. “Operation Car Wash,” the investigation that uncovered the corruption, could be considered a triumph of accountability and the rule of law, though Schwarcz and Starling are skeptical, and complain that “routine procedures in adherence to the rule of law were used to serve interests contrary to the democratic values preserved in our institutions,” since such maneuvers were “justified by a congress whose members were in large part accused of corruption.” For the first time in Brazil’s history, a former head of state was convicted of crimes committed while in office, as were a recent president of the lower house of congress and numerous powerful and wealthy businessmen, who have been forced to return the financial rewards of their crimes. Prosecutors also seem to be closing in on other alleged offenders, including President Temer and the legion of elected officials implicated in the scandal who were decisively defeated in October’s election and will now lose their congressional immunity. And yet, as the authors note, “although democracy has moved forward, the Republic has stayed on the drawing board. A republic is not only a political regime—it is the res publica: that which belongs to the public, that which is in the public domain, that which is in the common interest, as opposed to the interests of private parties.” The republic’s “greatest enemy is corruption,” they observed in 2015, before issuing a warning that now seems prophetic: “There is, however, a risk if the indignation over corruption becomes the raison d’être of political engagement. People could turn away from politics and participation in public life, which would lead to a loss in credibility of the democratic institutions.” With the victory of Jair Bolsonaro and the motley band of authoritarians, cranks, and grifters who surround him and are likely to compose his cabinet, that is exactly where Brazil finds itself late in 2018: profoundly disenchanted and once again expecting a messiah to put things right. Whenever I am in Rio de Janeiro, I make it a point to stop by the Museum of Modern Art to look at my favorite work there: a 1972 collage by Wesley Duke Lee, a descendant of the Confederate sympathizers who fled to São Paulo after the American Civil War, many of whom brought their slaves with them. On the top half of a scratched and rusted metal plate is engraved the green and yellow Brazilian flag, with a faded group portrait at the center replacing the national motto “Order and Progress,” while the bottom half consists of a single phrase printed in large black letters: “TODAY IS ALWAYS YESTERDAY.” That sentiment may well be true of just about any country—it was an American, William Faulkner, who wrote that “the past is never dead. It’s not even past”—but it seems especially applicable to Brazil, as Schwarcz and Starling make clear in their illuminating, engrossing, and consistently thoughtful book.